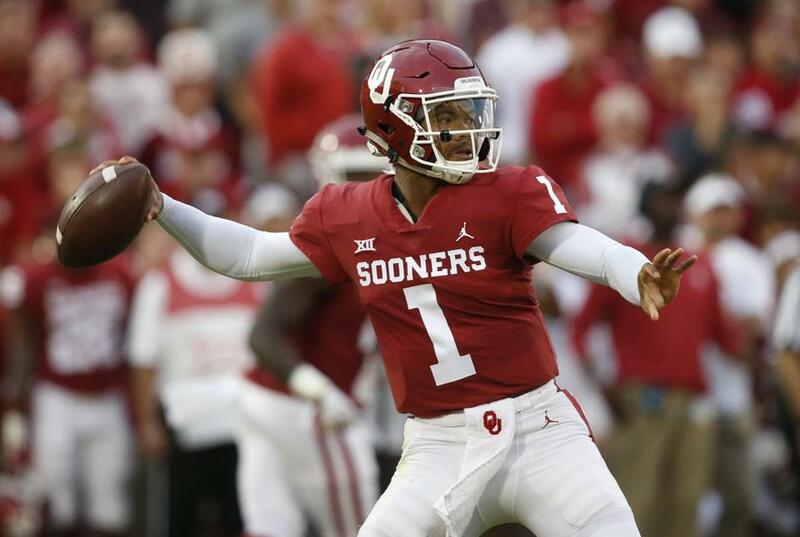 Oklahoma quarterback Kyler Murray was named the Associated Press Player of the Year on Thursday and added the Davey O’Brien Award, presented to the nation’s best college QB, at ESPN’s College Football Awards Show in Atlanta. Murray beat out Alabama quarterback Tua Tagovailoa on 56 ballots submitted by AP college football poll voters and announced Thursday. Ohio State quarterback Dwayne Haskins Jr. was third. ‘‘It’s humbling and an honor to be named AP Player of the Year, to be mentioned in the same realm as a lot of great players, a lot of hall of famers,’’ Murray said. ‘‘It’s a special deal for me and hopefully I can continue to make my family and teammates proud.’’ Murray received 39 first-place votes and a total of 145 points. . . . Tagovailoa, a Heisman Trophy finalist, won the Walter Camp Award presented to the nation’s best player. The last five winners of the award have gone on to win the Heisman. Tagovailoa also added the Maxwell Award to his list of postseason honors . . . Alabama receiver Jerry Jeudy was named winner of the Biletnikoff Award, given to the nation’s best receiver. UMass senior Andy Isabella, who led the nation in receiving with 102 catches for 1,698 yards and 13 TDs, was among the finalists for the award . . . Notre Dame coach Brian Kelly was named Home Depot Coach of the Year . . . Alabama defensive tackle Quinnen Williams won the Outland Trophy as the nation’s best interior lineman, Kentucky’s Josh Allen won the Bednarik Award as the nation’s best defensive player, Texas A&M’s Braden Mann won the Ray Guy Award as the nation’s best punter, and Syracuse’s Andre Symzt won the Lou Groza Award as the nation’s best kicker . . . Temple head coach Geoff Collins, a native of Georgia, has emerged as the frontrunner for the vacancy at Georgia Tech. Chicago Cubs closer Brandon Morrow likely will miss the start of the season following an arthroscopic surgical procedure on his right elbow on Nov. 6, accordin to president of baseball operations Theo Epstein. Signed to a $21 million, two-year contract last December, Morrow led the Cubs with 22 saves and had a 1.47 ERA in 35 games. He did not pitch after July 15 because of a bone bruise in his right elbow . . . Robinson Chirinos finalized a one-year, $5.75 million contract with the Houston Astros, bolstering the ballclub’s depth at the catcher position after Brian McCann, Martin Maldonado, and Tim Federowicz became free agents. The 34-year-old spent the past six seasons with the Texas Rangers and hit .222 this year while setting career bests with 18 homers and 65 RBIs in 113 games . . . The Cleveland Indians signed elite righthanded starter Carlos Carrasco to a four-year contract extension through the 2022 season with a club option for 2023. Carrasco went 17-10 with a 3.38 ERA in 30 starts last season for the AL Central champions . . . The Minnesota Twins and free agent second baseman Jonathan Schoop agreed on a one-year, $7.5 million contract. Schoop was an All-Star with Baltimore in 2017 when he hit a career-high 32 home runs before being traded to Milwaukee right before the non-waiver deadline. James Dolan, owner of the New York Knicks and Rangers, has agreed to pay more than $600,000 in civil penalties for running afoul of the Federal Trade Commission after Dolan failed to notify federal authorities he had acquired additional stock in the Madison Square Garden Company . . . Louis Oosthuizen shot a 9-under 62 to take a one-shot lead over Kurt Kitayama in the the first round of the South African Open in Johannesburg . . . Investigators cited a mechanical fault as the cause in the helicopter crash that killed Vichai Srivaddhanaprabha, owner of the English soccer team Leicester, and four others . . . Liverpool defender Joe Gomez will be out for up to six weeks after breaking his left leg in an English Premier League match against Burnley . . . Amelie Mauresmo declined to serve as captain of France’s Davis Cup team because the two-time major winner is going back to coaching to help Lucas Pouille.